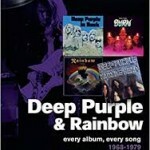 Share the post "Book review: ON TRACK…ELP, DEEP PURPLE & RAINBOW"
Two books in a series, that are subtitled “Every Album, Every Song”. These track by track intros to bands are not a new idea, and can often provide a lot of information (discographical and both objective and subjective opinion). 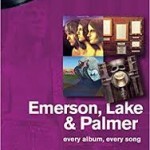 Progressive rock trio (Keith) Emerson, (Greg) Lake & (Carl) Palmer were rightfully considered a supergroup when they formed in 1970, with pianist (and Moog advocate) Emerson formerly of The Nice (arguably the first prog rock band), bassist/guitarist Lake formerly of King Crimson (whose debut is considered the greatest ever prog album), and drummer Carl Palmer formerly of Atomic Rooster. The early 70s studio albums are really well worth the read alone, as the intro to each album is informative, and puts their classic albums into perspective. The eponymous debut set the tone lightly, while ‘Tarkus’ and ‘Trilogy’ are expanded on well. Also included in with these studio albums is the live ‘Pictures At An Exhibition’, as much of the music is based on work by Mussorgsky. What’s beneficial to readers on these early albums is the highlighting of classical work on Emerson, which wasn’t always credited. The band’s magnum opus, ‘Brain Salad Surgery’, with the epic ‘Karn Evil 9′, is album you really should own. Interestingly the only track ‘Benny The Bouncer’ not featured on the subsequent triple live album was actually played at that show. It’s rare I learn stuff like that now so I love it even more for that. The Deep Purple/Rainbow book, equally interesting, suffers from the fact that even before the ’68-’79 caveat, opens a minefield. Pandora’s Box? Piece of cake in comparison. I know it’s tough to know where to draw the line, but even with that caveat, the Deep Purple discography and family tree is both so complex and central to the rock music scene, the 60s work of the members cannot really be avoided in order to do justice. That said, the format follows that of the aforementioned ELP book and makes for interesting reading. The three Mark 1 albums are much underrated and the info here is good. The basis of the band’s sound is developed, and details of the track ‘Hush’ are good; it was effectively a cover that made the band, certainly in the US. And like ELP’s Pictures…, ‘The Concerto For Group & Orchestra’ is included as it was a stand alone rather than a regular live album. The confusion of band members and fans is mentioned, the fact that some of Gillan’s lyrics were written so last minute as to be almost adlibbed, alluding to “What am I doing here….” Is not covered so much. A good read is the much known ‘In Rock’; while some influences are discussed, including King Crimson, the blatant derivative of The Nice on one track not so much. The Deep Purple work – largely well worth a read, lots of excellent information. But like much of these books, there are gaps, but it depends on how deep you want to go. The post 1984 albums are equally well worth investigating. The Rainbow albums, lovely, much deserved, but scant. The band’s formation could have been expanded on. Little things like the solo on ‘A Light In The Black’ being split into 2 parts, it is actually 4, and not mentioning that that track was as good as recorded first take, all could have been expanded on. Blackmore has since said that he had wanted to re-record the album as the bass was so low in the mix. The follow up ‘Long Live Rock’n’Roll’ is also not done justice, but then the recording process was complex with bassist and keyboard player comings and goings. One track that sounds like Blackmore playing bass (he did on some tracks) is credited to Daisley, and the fact that the keyboards on ‘Kill The King’ are barely inaudible and the guitar overdubs follow a line Carey could have played, well, you can see it’s an album that needs a book in its own right. As an absolute fan and collector of the Deep Purple Family Tree, it is a good book that tells you much, but if you’re going to cover Rainbow, do it properly, and what about Gillan, Whitesnake and solo work? Like I said, a minefield best not crossed all in one go, one decade at a time or not. The bibliography is a little short here too. This entry was posted in All Posts, BOOK REVIEWS and tagged Blackmore, books, Carl Palmer, classic rock, Deep Purple, ELP, Gillan, Greg Lake, Keith Emerson, Mike Goode, On Track, prog rock, Rainbow, review, rock, Sonic Bond Publishing, Steve Pilkington. Bookmark the permalink.